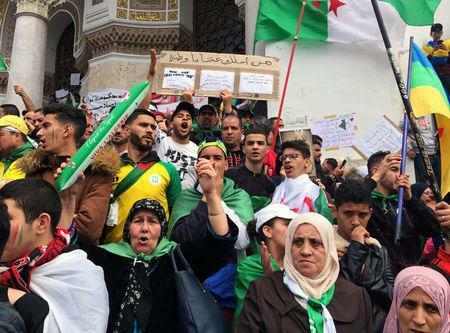 ALGIERS (Reuters) - Hundreds of thousands of protesters demanding radical change marched through Algiers for a seventh successive Friday, as Algeria's spy chief was reportedly fired in a further sign of high-level turbulence after the veteran president resigned. "We want a new generation to govern this wealthy country and to secure a better future for the people," said 80-year-old woman Yamina, standing with her five grandchildren as crowds jammed downtown streets. "We want to uproot the symbols of the system," said teacher Ahmed Badili, as hundreds of people waved national flags from the balconies of buildings. Others handed out sweets and bottled water. Western powers are eager for stability in the OPEC oil producer, Africa's largest country by land mass and a key gas supplier for Europe and partner to fight militants. Bouteflika's departure has not eased tensions despite the appointment of a caretaker government which will stay in office until elections in three months' time. This Friday, protesters pushed for the removal of Prime Minister Nouredine Bedoui, upper house of parliament chairman Abdelkader Bensalah, and Tayeb Belaiz, head of the constitutional council -- all seen as establishment figures. Many banners read "3B's must go." In the weeks before his resignation, Bouteflika's inner circle had already been depleted by the exit of several close allies from influential positions in politics and business. Tartag's departure was reported by the private Ennahar TV, and two political sources confirmed that he had been sacked. Ennahar added that his position would return to the supervision of the defence ministry, rather than the presidency, a move that appears to strengthen the army's hand. The intelligence service has in the past been an important part of the military's influence in national affairs, and played a backroom role in politics as well as in the 1990s civil war. Protesters want to remove any traces of the old guard and introduce sweeping democratic reforms. But no clear successor to Bouteflika has yet emerged and Algeria's opposition is fragmented. Unlike in past protests, when some Algerians said the army should not interfere in civilian matters, there were signs of support for the military in the latest demonstration. Some banners said "the people and the army are brothers." Some protesters saw humour in Algeria's crisis: "Any country interested in toppling its system, we are ready to help. Please send a copy of the constitution. You also need an appointment and we only work on Friday," read one banner.